Follow us on @fallaseljuego ! Meet the events of Las Fallas of Valencia popular festival through the five minigames that set Fallas: The Game. 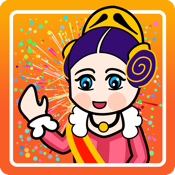 Marieta the Fallereta will show you Las Fallas of Valencia highlights through 20 game levels to ensure hours of fun. Meet the events of the popular festival of Valencia through five games: Prepare fireworks to impress Marieta, blow up firecracker displays, entertain the "Fallera", collect bouquets to prepare the Virgin’s Robe at the Floral Offering , become a firefighter the day of the "Cremà" or a waiter who delivers chocolate with "fritters" to his impatient customers. Fireworks : Get the best combination of rockets to dazzle the fallera. The "mascletà": Mr. Pyrotechnic, you can start the "mascletà", will you be able to level it? Floral Offering : Catch the bouquets to dress the virgin but, be careful with rubbish! The cremà : St. Joseph's Day is the "cremà" time, can you control the fire? Fritters with Chocolate: Nothing better than a chocolate with "fritters" on "Fallas", don't let anyone get no ration!